Loving these reviews - takes me back to my formative teenage years. Welcome to the Pleasuredome was an album (at least side one) I enjoyed back then and revisited it after reading your excellent review. Hasn't aged terribly well not surprisingly. Likewise U2/Bowie/McCartney etc. Not a great era for music in general but I have an unexplained sentimental attachment to a lot of it. Great to revisit via your exquisite blog. I thought it was quite good. But I was 16 at the time and my music tastes, much like myself, were not very mature. However this album gave me a gateway to investigate the original artists of the songs they'd covered. Springsteen, Floyd, Dionne Warwick were not bad things to want to hear more of. Gerry and the Pacemakers was a step too far though. I see that it may be back very soon, bigger than before, foam fitments and all. Rather like Squeeam, I thought it rather good in its moment. As a thirteen-year-old then, Mr Morley's cultural grandstanding appeared to open an exciting window on stuff that I wasn't going to be getting acquainted with doing GCEs at a Catholic grammar school. I heard of Warhol for the first time reading those liner notes and understood what Picasso was about rather better after seeing the artwork. The realization that Chris Barrie was quoting Hitler in his Ronald Reagan mode seemed rather daring in my adolescence, rather than simply adolescent. Juxtaposing that post-Munich-putsch speech with references to characters then suffering on 'Brookside' (who happened, I discovered some years later, to have the same name as a Dylan b-side cause celebre) made Morley's posturing feel plugged in to the ordinary that I was then experiencing. He was messing up high-brow and mainstream cultures a good many years in advance of that post-modernist dawn of Burchill and Young that's celebrated fastidiously nowadays. So I'll always think of him kindly for that. I heard 'Lexicon of Love' after I knew this record. In fact, I found the ABC record around which this blog pivots because Trevor Horn made this record under the alias of Frankie Goes to Hollywood. With the benefit of our decades of hindsight, 'The Lexicon of Love' is an album full of clever ideas facilitated by the producer which seems to have wrecked the band when it tried to tour it. 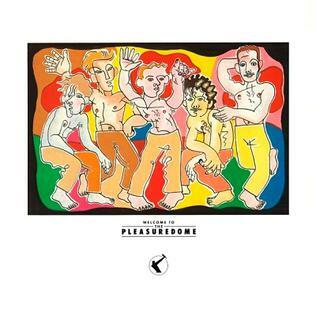 'Welcome to the Pleasuredome' is a record lacking in ideas that is set free by the same producer to make its own way in the world almost independent of the band caricatured on the cover, in the liner notes and on many of the vignettes included on sides F, G, T and H. That I used to use the 'Relax' to the 'Born to Run' bit to time my showering and getting dressed for sixth-form college might demonstrate my affection for that bit of the record. Reading it put me in mind of Bill Drummond’s one-minute video diatribe about why singles are better than albums (http://www.youtube.com/watch?v=_GBq-s87R24). In the Liverpool scene years, he used to fantasise about a band that would record one perfect single and then disband. As you observe, he helped create another excoriating trilogy of singles that also sounded far removed from anything else at the time, so he should know. And while ‘White Room’ is a better album than ‘Pleasuredome’, it certainly doesn’t sustain the energy of the Stadium House trilogy for its whole length. Then again, how listenable would such a hypothetical album actually be? Would it be just too tangy, as ‘Sgt Pepper’ might have been with ‘Penny Lane’ and ‘Strawberry Fields’ included? Hits comps can be that dense, but they’re not about a single moment in the way ‘Pleasuredome’ wanted to be. In one sense, records like the Frankie singles only made sense in terms of themselves. But in another, they needed some surrounding dross on which to turn their firepower. If Peter Powell had just played, say, Sade, and the next record crashed in with an air-raid siren and a Russian orchestra, you better believe you sat up and took notice. Banning ‘Relax’ guaranteed success while robbing it of this sort of context. Like punk records, those towering Horn productions needed something to stand out from, or kick against; back to back, they get wearing. Propaganda’s ‘Jewel’, another glittering creation, was appositely named. As teenagers who’d been blown away by the singles, we wanted to like it (and even its sequels) and we really tried to – unhampered by knowledge, taste or the slightest respect for Bruce Springsteen, and titillated by the rude bits. In the end, though, the record’s sheer mehness just wore us down. (The stuff on the sleeve passed us by completely – not because we were obtuse, although we certainly were, but because, as you say, it’s nothing to do with the music.) Having very convincingly blown away the surrounding dross of the charts, Frankie ended up creating their own. If there's a future TPL entry I get a certain whiff of here, it's entry #576, the one *before* Be Here Now. Both were widely seen as bringing back shock value and generational divides at times when other dominant forms of pop were dissipating that, both coasted on two gigantic singles released some time before which seemed rather unnecessary by the time they were reprised on the album (and in both cases, the first single had not been played on TOTP when it was number one), both were hyped *beyond* the max ... and in both cases there was, very quickly, a sense of "is that all there is? ", a sense that they'd overstepped the mark and overegged the pudding (and in the case of entry #576, a controversy too far followed by what felt like a three-decade silence). But then perhaps this blog will have differing views when it gets that far. There did seem to be an extraordinary wave of hyped entries which tended to seem hollow in the summer of 1997, though: of the creators of entries #573, #575, #576 and #577, all except the makers of #575 had definitely lost a lot of their status and cultural position within even six months of the albums confirming their place here, and in the case of #575 it was definitely the end of a certain road for them, not something that could have been followed on pure market terms. re. Paul Bentley's comment: even at his worst, I'd take Morley in a heartbeat over the Modern Review axis. Compared to that lot he certainly doesn't have the same whiff of neoliberalism, New Labour and Spiked Onlinery: his mistakes and misjudgements are different ones.